Clients who have been working with GoalMind. “Ruth always conveys motivation and a passion for her work. When I met Ruth I had already started in business and was very intrigued by what Ruth had to offer in terms of the motivational mapping. The motivational mapping process was carried out efficiently with a prompt response and feedback from Ruth. She took the time and patience to explain and expand on my answers/results which has given me great insight, helped me to identify my strengths and weaknesses, raised myself awareness and has given me a clearer vision to develop myself and my business. This has been an interesting and necessary experience for me as it has enhanced the clarity and focus of what I aim to achieve, both in my business and as Yvonne. "I contacted Ruth shortly after I was made redundant and needed some assistance to decide what my next career move should be. She not only help me gain clarity on what types of roles motivate me and why, we worked together to set some clear goals. Throughout the process, she was very professional and credible. I would have no hesitation in highly recommending her services." "When we had new employees join our management team we required some team building to quickly get us operating effectively. Ruth provided the Motivational Map as the tool to use to identify strengths and weaknesses in the new team in delivering our revised business plan. Talking through the outcomes with Ruth, she enables us to understand the gaps in competences and plan for very specific training, which has served us well. Ruth is a consummate professional, an excellent coach and demonstrates a good understanding of what is required to get the best out of people. " "Ruth is an exceptional practitioner, who takes the time to convey clearly the process and the benefits of motivational mapping. It is evident the passion and drive that Ruth has for this specialist area of coaching and, from my experience the outcome of my motivational map was compelling. It highlighted my personal motivations and assisted our team in seeing how we can best draw on our individual strengths whilst working together." "Getting through the day can be something of an exercise in crisis management, with little opportunity for planning, self-fulfilment or achievement. Ruth delivered two Goal Mapping workshops at the Epilepsy Society Annual Conference last year. Goal Mapping provides a simple way of stepping off that roller coaster and realising that we can be the drivers of our own lives rather than being driven by what can seem like uncontrolled forces. By tapping into our sub-conscious, we can realise our full potential and reach further than the hand can stretch. Goal mapping uses visual imagery, tapping into both the left and right sides of the brain to help us plan, progress and succeed. It is about step-by-step achievement with us in the driving seat. It is simple, logical and makes such good common sense, it is hard to imagine not doing it. For those who may live with a chronic condition, it's a real means of empowerment, a way of taking hold of the reins rather than letting health issues call all the shots. Anyone can do it. Everyone should do it. I wish it was written into the start of every school term - particularly for teenagers. " "I completed the Goal Mind motivational mapping questionnaire with a view to finding out my team’s dynamics, strengths and weaknesses. Ruth completed the analysis and presented us with our individual feedback and I could see how our different motivations benefited the group. What I found most interesting is how accurately my motivation was revealed! As a result of this, I find I pay much closer attention to what I do in line with my newly confirmed motivation, and, strangely enough, it motivates me!!! I found this an extremely enjoyable, interesting and valuable process. 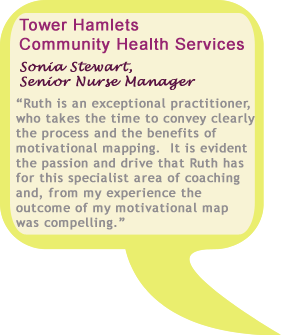 Thank you so much Ruth because I believe that the motivational mapping process has helped me both professionally as well as personally. " 2011 Copyright GoalMind. All Rights Reserved.